While planning for a tour, it is important to decide the place where you are going to stay. Well it is better to make sure your place of stay in advance so that it would be a comfortable and pleasant one. One such promising Hotel in the North Cyprus is the renowned hotel, The Dee European Hotel. This luxury hotel has the state of art features and it has all the modern amenities. All the facilities provided by the hotel are updated from time to time to make sure that the guests enjoy the maximum fun while touring North Cyprus. 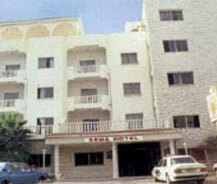 This hotel is situated in the heart of the city of Famagusta which is a historical place. Amenities provided by The Dee European Hotel ranges from television-radio systems to American bars that are centrally air conditioned. This hotel offers an eye catching view of the historical city. If one looks to the city from the terrace, it gives them bird's view of the Famagusta, the walled city. The city stands tall in the midst of all the important places of the city includes Nicosia, the capital that is just an hour away from the hotel and the airport that is half an hour away. The multipurpose halls can be used for all kinds of occasions such as conferences or functions etc.